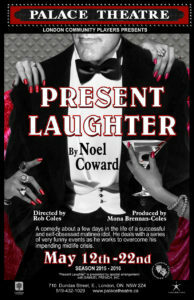 Noel Coward is considered of the great British comedians for several reasons and this play is a good one. Here, we see the epitome of the sophisticated drawing room comedy he was famous for with cutting wit and memorable characters well played by a good cast. Garry Essendine (Todd Baubie) is a successful matinee theatrical star who is dealing with a mid-life crisis being in his late 40s, only to find that is the least of his life’s complications. That is because Garry is inundated with fans, relatives and partners of either questionable motives or sanity even as he prepares for a tour abroad. Amidst this, Garry has to dodge intrusions and double dealing even as he tries to discover what he really wants in his life. As the embodiment of British wit, this play is obviously a disguised autobiography to some degree. To that end, the story is an enjoyable one about the pressures of an aging entertainer who is still in his career prime even as the march of time is bearing down on him. The story abounds with urbane comic conflict and misunderstandings with a surprisingly effective wistful touch about getting old. In fact, it is that latter tone that grants a welcome emotional universality to the story that transcends its upper class British setting for a larger world. With that story in mind, the players bring it to life with glorious talent. For instance, Baubie plays the lead with an understated snarky presence as a man who has it all materially, but is still frustrated by human anxieties that no high life can completely bury. By contrast Elizabeth Durand is fun as Monica Reed, Garry’s frustrated secretary who has to accommodate the most awkward parts of her employer’s life. Jane Upfold adds some welcome physical comedy as Miss Erikson, a housemaid who has seen it all with her employer and has long been at peace with it enough to figure out how to take advantage of it. Unfortunately, while Sara Brookfield has some genuine pathos as one of the women Garry has to push aside, Robyn Deverett feels far less convincing as Joanna with a manner and accent feeling more like Frank Oz’s Miss Piggy than anything convincingly human. While the supporting players like Robin Rundle Drake and Christopher F. Parker as Garry’s estranged wife and frustrated producer, respectively, are able players, the real standout at that tier is Stephen Flindall as Roland Maule. Compared to the others, Flindall is able to cut loose with hilarious aplomb as the crazy would-be playwright and groupie who knows no boundaries or inhibitions with his idol. Much like how Coward’s homosexuality was obvious to all but still delicately unspoken during his life, Flindall’s character is the perfect personal metaphor that only a man with the artistic confidence of Coward could have dared write in the 1930s. To watch him is to see a farcical delight that becomes much more if you look under the surface. The stagecraft is of a standard semi-minimalist design with the requisite hallways and doors to give the illusion of a well appointed home. However, the costuming is exquisite, from Gary’s suits and housecoats to Miss Erikson’s comically shapeless work clothes to Joanne’s over-the-top evening gown. With such accoutrements, the period of the play is effortlessly established with subtlety and grace. To the casual viewer today, Noel Coward can seem too genteel and refined to be enjoyable. If that’s your belief, just watch this and see the humour and true sophistication of a great British master. Sorry about that; I haven’t seen the play yet so wasn’t aware of the mixup. Fixed, thanks!